A metal glycol-based hydraulic fluid having vapor phase corrosion inhibition properties is disclosed. The hydraulic fluid can be used in food related applications. This application claims the benefit of U.S. Provisional Patent Application No. 61/092,483, filed August 28, 2008, incorporated herein by reference in its entirety. The present invention relates to water-glycol (W/G)-based hydraulic fluids and to the prevention of vapor phase corrosion attributed to use of a W/G-based hydraulic fluid. More particularly, the present invention is directed to a W/G-based hydraulic fluid containing an ammonium salt as a vapor phase corrosion inhibitor. The hydraulic fluids can be used in a variety of practical applications, including food-related applications. Hydraulic fluids are used as a power transmitting medium for a variety of practical applications. These hydraulic fluids must meet stringent performance criteria, such as thermal stability, fire resistance, low susceptibility to viscosity changes over a wide range of temperatures, good hydrolytic stability, and good lubricity. Several hydraulic fluids are based on mineral oils. These hydrocarbon-based fluids met the performance criteria, and did not pose a significant corrosion problem because the fluids were essentially free of water. Hydrocarbon-based hydraulic fluids however do pose a potential fire hazard. Several present-day hydraulic fluids therefore are based on water- glycol mixtures, which overcome the fire hazard concerns, but corrosion of metal parts becomes a significant problem. The W/G-based hydraulic fluids contain significant amounts of water. The water level in some fluids can be as high as 60%, by weight, and typically is at least 35%, by weight. The presence of a high percentage of water in the fluid, when heated to operating temperatures of 1500F or higher in a hydraulic system and in the presence of air/oxygen, creates ideal conditions for corrosion of metal parts made of non-stainless steel or cast iron. Various additives are included in W/G-based hydraulic fluids to inhibit corrosion of metal parts. For example, morpholine and other alkyl alkanolamines have been used as a vapor phase corrosion inhibitors in industrial, nonfood-related applications. However, a need still exists for the inclusion of a useful inorganic vapor phase corrosion (VPC) inhibitor in a W/G-based hydraulic fluid, and particularly for a W/G-based hydraulic fluid for use in food- related applications. Presently, no commercial VPC inhibitor designed for a W/G-based hydraulic fluid meets the requirements of the Food and Drug Administration (FDA) for use in food-related applications. The present invention is directed to W/G-based hydraulic fluids that inhibit the vapor phase corrosion of exposed metal surfaces. More particularly, the present invention is directed to a W/G-based hydraulic fluid comprising an ammonium salt as a VPC inhibitor. The present fluids are suitable for use in food-related applications. Prior W/G-based hydraulic fluids used in food-related applications did not contain a VPC inhibitor, and therefore lacked an important performance property. The present W/G-based hydraulic fluids overcome this unsolved problem. Therefore, one aspect of the present invention is to provide a W/G-based hydraulic fluid that inhibits corrosion of exposed metal surfaces caused by vaporization of the hydraulic fluid. A present W/G-based hydraulic fluid comprises an ammonium salt as a VPC inhibitor. Still another aspect of the present invention is to provide a method of inhibiting, retarding, or preventing the vapor phase corrosion of exposed metal surfaces caused by a hydraulic fluid comprising incorporating an effective amount, e.g., about 0.05% to about 1%, by weight, of an ammonium salt in a W/G-based hydraulic fluid. (g) about 25% to about 50%, by weight, water. Another aspect of the present invention is to provide a W/G-based hydraulic fluid having a reserve alkalinity of at least about 20 nil. in order to extend the useful life of the hydraulic fluid. These and other aspects of the present invention will become apparent from the following detailed description of the preferred embodiments. Fig. 1 contains photographs of cast iron plates exposed to vapors of a comparative W/G-based hydraulic fluid (left side) or to vapors of a present W/G-based hydraulic fluid containing an ammonium salt (right side). The present invention is directed to W/G-based hydraulic fluids. W/G-based fluids are widely used because they are fire resistant. A present W/G-based hydraulic fluid can be used in a variety of practical applications, especially including food related applications. In accordance with an important feature of the present invention, exposed metal surfaces resist vapor phase corrosion caused by evaporation of W/G-based hydraulic fluid at elevated operating temperatures. A W/G-based hydraulic fluid of the present invention inhibits, retards, and/or prevents corrosion of exposed metal surfaces. Corrosion of a metal surface is inhibited, retarded, or prevented when a metal surface is visually less oxidized by vapors of a W/G- based hydraulic fluid containing an ammonium salt compared to the amount of visual oxidation of an identical metal caused by an identical W/G-based hydraulic fluid that is free of, or essentially free of, an ammonium salt. A W/G-based hydraulic fluid that is "essentially free" of an ammonium salt contains less than about 0.05%, by weight, of an ammonium salt. Corrosion of a wide variety of metal surfaces can be inhibited, retarded, or prevented using a composition and method of the present invention. For example, corrosion can be inhibited on metal surfaces, including, but not limited to, iron, titanium, aluminum, copper, zinc, nickel, cobalt, chromium, magnesium, and other metals. The composition and method of the present invention also can be used to protect alloys such as, but not limited to, steel. (g) about 25% to about 50%, by weight, water. A present hydraulic fluid is suitable for use in a variety of practical applications, including food-related applications. The present W/G-based hydraulic fluids inhibit, retard, and/or prevent vapor phase corrosion of exposed metal surfaces attributed to use of these hydraulic fluids. An important feature of the present invention is an ability to use a present hydraulic fluid in food-related applications. Currently no commercial VPC inhibitors are approved by the FDA for prevention of VPC resulting from the use of a hydraulic fluid. After extensive research, suitable corrosion inhibitors were found that also could be used in compositions for use in incidental food contact lubricants (21 C.F.R. §178.3570). A present hydraulic fluid comprises about 25% to about 50%, by weight, of a glycol. In preferred embodiments, a present hydraulic fluid comprises about 30% to about 45%, by weight, and more preferably about 35% to about 40%, by weight, of a glycol. A glycol is included in the composition as an antifreeze and diluent, and to provide some viscosity control. The glycol can be, for example, ethylene glycol, propylene glycol, butylene glycol, pentylene glycol, hexylene glycol, diethylene glycol, dipropylene glycol, dihexylene glycol, triethylene glycol, tripropylene glycol, trihexylene glycol, and mixtures thereof. Other similar glycols also can be used. A present hydraulic fluid also contains about 0.5% to about 8%, and preferably about 1% to about 6%, by weight, of a partially-neutralized aliphatic Cβ-Ciβ carboxylic acid, linear or branched. The partially neutralized C6-C1O carboxylic acid acts as a boundary lubricant to improve performance of the W/G-based hydraulic fluid, especially with respect wear resistance and sludge solubility. The aliphatic CS-CK, carboxylic acid can be one or more of hexanoic acid, heptanoic acid, octanoic acid, nonanoic acid, decanoic acid, lauric acid, undecanoic acid, myristic acid, pentadecanoic acid, palmitic acid, tridecanoic acid, 2-ethylhexanoic acid, and 2-propylhexanoic acid, for example. Preferred C&-Ci6 carboxylic acids contain six to ten carbon atoms. A neutralizing agent is added to the W/G-based fluid in a sufficient amount to neutralize at least a portion of the carboxyl groups of the C^CK, carboxylic acid. The aliphatic C6-C]6 carboxyl acid is neutralized with neutralizing agent, typically an alkali metal hydroxide, such as sodium hydroxide, potassium hydroxide, lithium hydroxide, or a mixture thereof. A preferred neutralizing agent is potassium hydroxide. The neutralizing agent is added in a sufficient amount to neutralize at least about 50%, and preferably at least about 60%, and up to about 99%, but less than 100%, of the carboxyl groups of the Ce-Ci 6 carboxylic acid. A present W/G-based hydraulic fluid also contains about 15% to about 40%, by weight, of a polyalkylene glycol. In preferred embodiments, the polyalkylene glycol is present in an amount of about 20% to about 30%, by weight, of the fluid. The polyalkylene glycol serves as a thickener to provide a desired viscosity. The identity of the polyalkylene glycol is not limited, and several commercial polyalkylene glycols are available for use in a present W/G-based hydraulic fluid. The polyalkylene glycol typically is a copolymer of ethylene oxide (EO) and propylene oxide (PO), in a ratio of EO to PO of about 10 to 1 to about 1 to 10. Homopolymers of EO and PO, i.e., polyethylene glycol and propylene glycol, also can be used as the polyalkylene glycol. The polyalkylene glycols have a molecular weight of at least about 5,000, typically in excess of about 10,000, up to about 200,000, for example. One polyalkylene glycol or a mixture of polyalkylene glycols can be used in a present W/G-based hydraulic fluid. One commercial class of polyalkylene glycol useful in the present W/G-based fluid is the PLURASAFE® products, available from BASF Corp., Floral Park, NJ. An example of a useful PLURASAFE® product is PLURASAFE® WT 90000 H, a composition containing 60% by weight of methyl-oxirane polymer with oxirane (CAS No. 9003-11-6) and 40% by weight water. PLURASAFE® WT 90000 H is approved for incidental food contact. Other useful PLURASAFE® products are WS-660, WS-2000, WS-5100, WT-1400, WT-9150, and WT- 150,000. Each of these PLURASAFE® products is approved for incidental food contact. In accordance with an important feature of the present invention, a present W/G- based hydraulic fluid comprises a sufficient amount of an ammonium salt to inhibit, retard, and/or prevent the vapor phase corrosion of a metal surface exposed to vapors of a W/G- based hydraulic fluid. Typically, the W/G-based fluid contains about 0.05% to about 1%, by weight of the ammonium salt, In preferred embodiments, the W/G-based fluid contains about 0.1% to about 0.8%, and more preferably, about 0.15% to about 0.6%, by weight of an ammonium salt. The identity of the ammonium salt is not particularly limited. However, the ammonium salt must be water soluble in the amount added to the hydraulic fluid and must permit vaporization of ammonia at operating temperatures to protect exposed metal surfaces from VPC. Suitable ammonium salts include, but are not limited to, ammonium hydroxide, ammonium carbonate, ammonium acetate, and mixtures thereof. Each of these ammonium salts is approved as a food additive for human consumption. Another component of a present W/G-based hydraulic fluid is a sufficient amount of a buffering alkali to provide a reserve alkalinity of at least about 20 ml. Hydraulic fluid wear performance is directly related to fluid pH, and accordingly the pH is maintained at a sufficiently high value. A buffering alkali controls the reserve alkalinity, pH, and acidity of the hydraulic fluid. Reserve alkalinity is reported as the volume (in milliliters) of 0.1 M hydrochloric acid required to titrate 100 ml of a W/G-based hydraulic fluid to pH 5.5. In preferred embodiments, a sufficient amount of a buffering alkali is present to provide a residual alkalinity of at least about 22 ml, and more preferably at least about 25 ml, up to a reserve alkalinity of about 35 ml. At this reserve alkalinity level, the useful life of the W/G-based fluid has sufficient buffering capabilities to maintain the pH of the fluid at about 9 or higher, e.g., about 10 to about 12, and avoid large, rapid pH fluctuations. Preferably, the pH of the hydraulic fluid is maintained at about 9 to about 11. Useful buffering alkalis therefore include, but are not limited to carbonates, bicarbonates, borates, tetraborates, phosphates, and mixtures thereof. The buffering alkali can be added as the sodium or potassium salt, for example. A W/G-based fluid of the present invention further comprises optional ingredients known to persons skilled in the art of hydraulic fluids. These optional ingredients include a defoamer, a dye for leak detection, and a metal deactivator to prevent corrosion of metal in contact with the liquid W/G-based hydraulic fluid. These optional ingredients are present, in total, in an amount of 0% to about 0.5%, by weight, of the fluid. Suitable metal deactivators include the IRGAMET® class of metal deactivators available from CIBA, such as IRGAMET® 30, 39, 42, BTZ, and TTS. The defoamer is typically a silicone-based defoamer.
' Typically ammonium carbonate, ammonium hydroxide, ammonium acetate, or mixtures thereof, on a 100% active basis. The ammonium salts tested were ammonium hydroxide, ammonium acetate, and ammonium carbonate. Each ammonium salt is listed as a food additive for human consumption. The first test was performed using a W/G-based hydraulic fluid, i.e., the typical example above containing 0.5%, by weight, ammonium hydroxide, about 40% propylene glycol, about 22.5% PLURASAFE® WT-90,000 H, about 0.2% sodium carbonate, and about 3.5% partially neutralized capric acid. This corrosion inhibition test utilized three cast iron plates suspended over 100 ml of hydraulic fluid in a cylindrical jar. The top of the jar was covered with a cork having an opening for condensing tube. The jar was placed in a constant temperature bath set at 1500F, and the sample was heated for 96 hours. The cast iron plates were observed visually for rust and corrosion. No visible corrosion was observed on any plate. A separate test using a control jar containing an identical hydraulic fluid, but containing no ammonium hydroxide (e.g., Comparative Example 1) resulted in heavy rust on all three cast iron plates. This test was repeated with W/G-based hydraulic fluids containing ammonium carbonate or ammonium acetate. No corrosion was observed on any of the cast iron plates in either test. Figure 1 illustrates the corrosion inhibition effects of a present, commercially available W/G-based hydraulic fluid. The photograph of the cast iron plate on the left shows substantial vapor phase corrosion, whereas the cast iron plate on the right is free of vapor phase corrosion. The panel on the left was subjected to vapors of a W/G-based hydraulic fluid free of an ammonium salt, whereas the panel on the right was subjected to vapors of an identical W/G-based fluid, but containing 0.5%, by weight, ammonium hydroxide. Presently, no commercial W/G-based hydraulic fluid is suitable for food related uses because no food grade VPC additives have been available for such fluids. 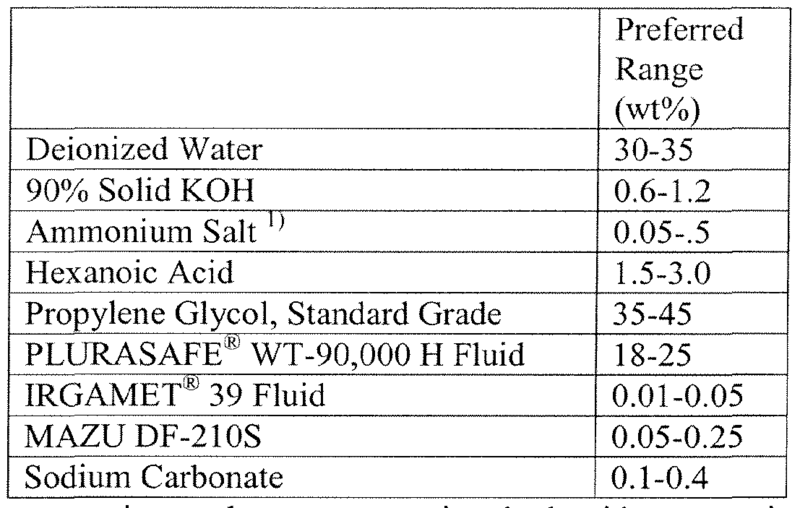 In testing various compounds approved for a direct food additive as a VPC inhibitor, it was found that only ammonium salts provided sufficient VPC protection, as demonstrated in the following Table 1. Table 1 shows that hydraulic fluids containing no VPC inhibitor, or containing sodium nitrite or sodium carbonate, did not pass the VPC test for 48 hours or 96 hours. Sodium nitrite passed the 24 hour test, but this length of time is insufficient for practical fluid applications. Hydraulic fluids containing ammonium hydroxide, ammonium acetate, or ammonium carbonate each passed the 96 hour VPC test. This VPC inhibition is attributed at least in part to volatilizing of ammonia, which imparts VPC inhibition to exposed metal surfaces. Tests using standard corrosion inhibitors, such as benzotriazole and polyquaternary compounds, failed to impart VPC inhibition because such compounds are not volatile under the operating conditions of the hydraulic fluid. To further improve performance of a present W/G-based hydraulic fluid, the reserve alkalinity is increased to greater than 20 ml by the addition of a buffering alkali. Reserve alkalinity is important to increase the useful life of the fluid. Hydraulic fluids having a low reserve alkalinity start exhibiting high wear in a shorter period of time. In this test, sodium carbonate (0.5%, by weight) was added to a W/G-based hydraulic fluid containing 0.25%, by weight, ammonium carbonate. The addition of sodium carbonate increased the reserve alkalinity from 15 ml to 22.5 ml. The W/G-based hydraulic fluid was operated at standard conditions of 1500F, and 1500 and 1750 psi. A pump test performed using the procedure of ASTM D2882 show on average wear one replicate tests of less than 70 mg wear. The ASTM D2882 test is conducted at 2,000 psi (13.8 MPa) for 100 hours and eight gallons per minute (30.6 L/min) in a Sperry Vickers V-104C vane pump. 2. The fluid of claim 1 wherein the glycol is selected from the group consisting of ethylene glycol, propylene glycol, butylene glycol, pentylene glycol, hexylene glycol, diethylene glycol, dipropylene glycol, dihexylene glycol, Methylene glycol, tripropylene glycol, trihexylene glycol, and mixtures thereof. 3. The fluid of claim 1 wherein the C^-CK, carboxylic acid comprises one of more of hexanoic acid, heptanoic acid, octanoic acid, nonanoic acid, decanoic acid, lauric acid, undecanoic acid, myristic acid, pentadecanoic acid, palmitic acid, tridecanoic acid, 2- ethylhexanoic acid, and 2-propylhexanoic acid. 4. The fluid of claim 1 wherein the C6-C 16 carboxylic acid is neutralized at least 50% to less than 100%. 5. The fluid of claim 1 wherein the polyalkylene glycol comprises a polyethylene glycol, a polypropylene glycol, an ethylene oxide-propylene oxide copolymer, or a mixture thereof. 6. The fluid of claim 1 wherein the polyalkylene glycol has a molecular weight of least about 5000 and up to about 200,000. 7. The fluid of claim 1 wherein the polyalkylene glycol comprises a methyl-oxirane polymer. 8. The fluid of claim 1 wherein the ammonium salt is one or more of ammonium carbonate, ammonium hydroxide, and ammonium acetate. 9. The fluid of claim 1 wherein the buffering alkali is selected from the group consisting of a carbonate, a bicarbonate, a borate, a tetraborate, a phosphate, and mixtures thereof. 10. A method of transmitting power or carrying a load comprising subjecting a hydraulic fluid of claim 1 to pressure. 11. A method of claim 9 wherein the power is transmitting or a load is carried in a food processing facility, a food preparation facility, or a food serving facility. 12. A method of inhibiting, retarding, or preventing vapor phase corrosion of an exposed metal surface caused by a hydraulic fluid comprising incorporating an effective amount of an ammonium salt in a water/glycol-based hydraulic fluid. 13. The method of claim 12 wherein the water/glycol-based hydraulic fluid comprises about 0.5% to about 1%, by weight, of the ammonium salt.